Light On Anxiety is thrilled to welcome our newest member of the therapy team, Bowie Kissen. Bowie is an Australian Labradoodle and rejoices in her job of spreading calm and love to all who visit the Light On Anxiety treatment center. 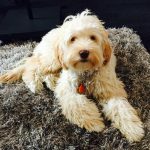 The Australian Labradoodle is an intelligent breed and often used as therapy dogs due to their special gift of empathy with human beings.